People by Crystal in Raffles Dubai is one of the most hot and happening nightspots in Oud Metha, Dubai. 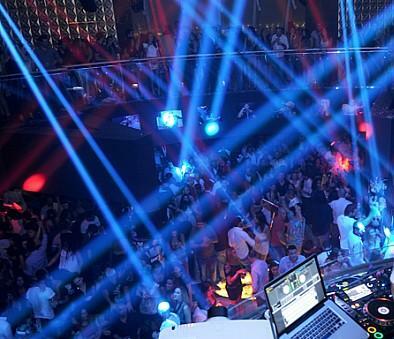 The experience of clubbing at this amazing nightclub is simply incomparable, as people of Dubai can not only amuse themselves with the hip and splendid music of various Djs, but they also get inspired with the design and decor of this breathtaking discotheque. For the reason that People by Crystal nests over a large glass pyramid, but its architect still has been able to make use of every inch of the space ideally. Due to these fine features, People by Crystal can be matched with any international level club in the world. - This nightclub has a splendid dance floor where guests tap their feet to funky beats. - Different Djs play their music at this venue and entertain the crowd. - Guests of People by Crystal can also savour food at this stirring spot, as they serve typical bar food. - In addition to this, drinks are also offered to the guests. Like most other nightclubs, People by Crystal also opens all days of the week and its operational hours are from 10:00 pm to 3:00 am. Raffles Dubai, Sheikh Rashid Road, Wafi, - United Arab Emirates. Dubai Healthcare City Metro Station 2 is just 350 metres away from People by Crystal. On foot this distance can be covered in approximately 4 minutes if a commuter heads in the east course on 26th Street from this metro station and then turns right onto 13th Street to locate the destination on the right side. Directions from Dubai Healthcare City Metro Station to People by Crystal. Bus numbers 22, 42 and C7 have stops at Dubai Healthcare City Metro station A2 – Dubai, which is the nearest bus station from People by Crystal, as it is just 450 metres away. This makes it a walking journey of about 5 minutes. Bus passengers can reach this nightspot from Dubai Healthcare City Metro station A2 – Dubai on foot if they head west on 26th St toward 13th Street and then turn left onto 13th Street to find the destination on the right side. 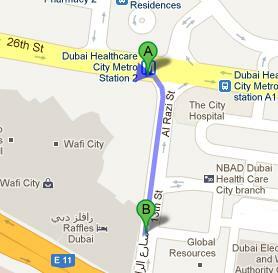 Directions from Dubai Healthcare City Metro station A2 – Dubai to People by Crystal.